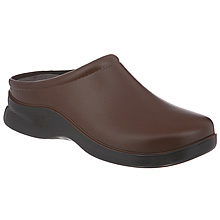 Enjoy long-lasting comfort with the lightweight Dusty clog from Klogs. The polyurethane upper wipes clean with soap and water; perforations add breathability and offer a whimsical touch. Perfect for days when you’re on your feet for extended periods of time. The polyurethane sole is slip-resistant, oil-resistant non-marking, and shock absorbent. 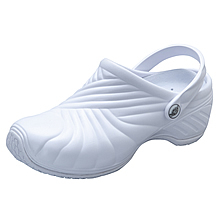 The removable Klogs Komfort footbed provides soft cushioning and excellent arch support that’s latex-free, antimicrobial, odor-resistant, and lightweight. 2" heel.